I know “Muslim style” and “No Dum” contradicts to go hand-in-hand. Still, trust me.. This tastes soooo good. I am a terrific Biriyani-Lover. 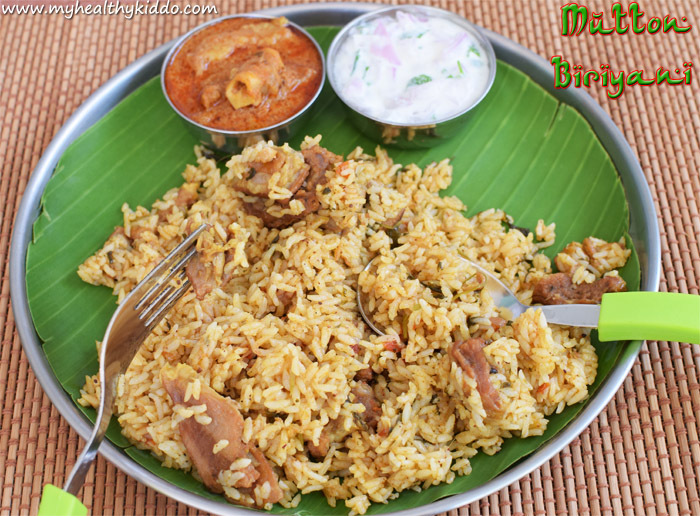 Never missed to taste famous biriyani stalls like Madurai Amma Mess, Dindigul Thalappaakatti, Kovai Angannan and the list expands..
1.Keep all the ingredients ready. Peel small and big onions. Wash and chop big onions, tomatoes, mint and coriander leaves. 2.Grind cinnamon(4)+cloves(3)+cardamom(6) to powder and then grind again with a tsp of water. 3.Grind small onions just for 2-3 pulses. In a pressure pan, add 1/3 cup oil and 1 tbsp ghee. 4.Add cinnamon(1),clove(1),bay leaves(2),green chillies(3), chopped onions(2) and a pinch of salt. Once onions become soft, add mint leaves and coriander leaves(Do not add all coriander leaves. Just reserve some for later use). 5.Once leaves shrink, add washed mutton pieces and fry for a minute. 6.Add a tbsp of plain chilli powder or any gravy powder. Fry for few seconds and add tomatoes. 7.Once tomatoes turn mushy, add ginger-garlic paste and fry for a minute. 8.Add coarsely ground small onions and fry for a minute or so till raw smell leaves. Add ground masala paste. 9.Fry for a minute. Add salt and water(1.5 cups). 10.Close the lid and cook for 5-7 whistles(10 minutes in high flame if you don’t count on the whistle) until mutton is cooked well. 11.Just after closing the lid, wash and soak rice in 3 cups of water for 20-30 minutes. 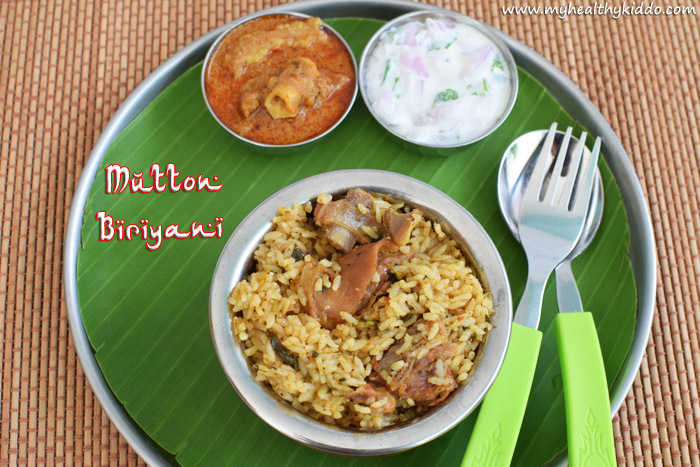 Rice gets soaked by the time mutton is cooked and pressure is released naturally. 12.Switch on the stove and add curd(1/2 cup), lemon juice(1 tbsp) and reserved coriander leaves to cooker contents. 13.Add the soaked water and 1/4 tsp rock salt. Mix well and let the mixture start boiling. 14.Now add rice and a tbsp of ghee. Once it starts to boil again, close the lid and keep the flame in medium high. When the first whistle is about to release, cut off heat and just press back the whistle with a ladle so that pressure is not released out. 15.Once pressure is released naturally,open the lid mix once, level it and again close the lid along with whistle(Stove switched off) and leave it untouched for 10-15 mins. 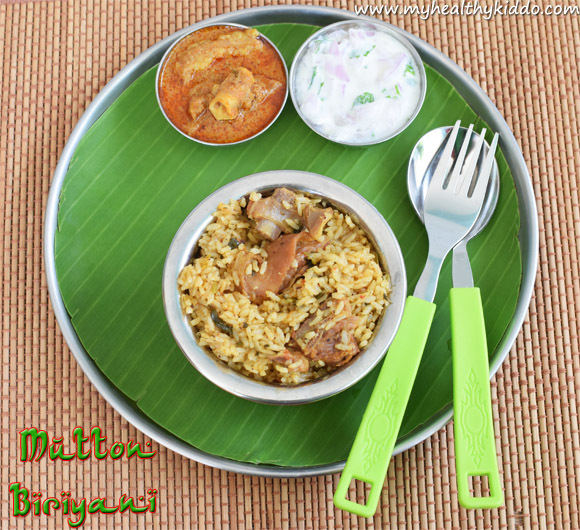 Aromatic, tasty Mutton Biriyani is ready… Relish with raita and mutton gravy. Yummmmm…..
Do not grind small onions to smooth paste. Coarse texture enhances the taste. For best result, use groundnut oil. If unavailable, use any cooking oil. Tastes best when mutton is fatty. Oil from fat adds taste to biriyani. Items under “To Grind to paste” can be ground using “Ammi”(Horizontal stone mortar) for a traditional touch and taste. If you feel rice is under-cooked, from next time, add rice along with soaked water. I get rice from the same shop and every time this timing and ratio works perfectly for me. It might slightly vary depending on rice quality and age. For dum, use cooker till you cook mutton. Then, use a large biriyani vessel and follow the same process. Add rice only when water comes to a rolling boil. Here, Rice:Water ratio will be 1:2. Close with a lid and keep stove in high flame. When water is absorbed(but before rice starts sticking to the bottom), simmer the flame and keep a dosa tawa under biriyani vessel. Once biriyani is done, place a newspaper on top of the vessel and place the lid on top of the newspaper so that there is no air space for the steam to escape and the lid closes tightly.Leave in this setup for 10 mins in sim. Thats it! Dum biriyani is ready! 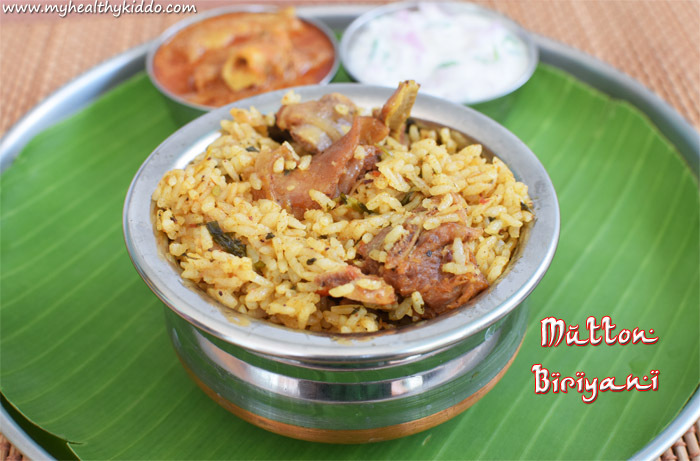 Check this link for Chicken Biriyani.